(CNN) -- Amid international condemnation after security forces reportedly attacked demonstrators at a peaceful rally, reportedly killing nearly 160 people, the Guinean government said Tuesday most of the victims were crushed in the crowd. 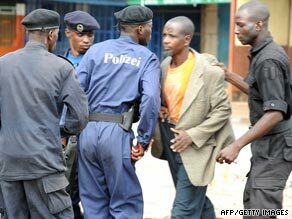 Police arrest a protester on Monday near a stadium in Guinea's capital Conakry during a protest. Reports put the death toll at 157, with more than 1,200 people injured, U.S. State Department Spokesman Ian Kelly said in a statement Tuesday. Earlier, the United Nations, citing media reports, said at least 58 people died Monday when security forces opened fire to disperse a demonstration at a stadium in the capital, Conakry. "The United States condemns the Guinean military's brazen and inappropriate use of force against civilians," Kelly said. "The military also stands accused of carrying out brutal rapes and sexual assaults on women demonstrators and bystanders during its rampage." On Tuesday, the African Union expressed its "grave concern" about the situation. "The [AU] Commission strongly condemns the indiscriminate firing on unarmed civilians, which left dozens dead and many others injured, while serious other violations of human rights were committed," the AU stated. Tens of thousands of people were protesting the rule of Capt. Moussa Dadis Camara, who seized power in a bloodless coup in December, according to U.S.-based Human Rights Watch. The United States demanded the immediate release of opposition leaders and a return to civilian rule, the State Department statement said. Human Rights Watch also condemned the violence against "generally peaceful demonstrators" and urged the government "to hold accountable the security forces." It quoted victims and witnesses who said security forces sexually assaulted women at the demonstration and also attacked demonstrators with knives and bayonets. "Women were raped by soldiers in the stadium. I saw them," former Guinean Prime Minister Sidya Touré told the French newspaper Le Monde. Touré led the country from 1996-1999 and was participating in the peaceful demonstration. The government maintained in a statement that "according to preliminary investigations, most of the innocent victims died as a result of being crushed in the crowd." And it blamed "certain political leaders" for staging the demonstration despite being asked not to do so and warned that security could not be guaranteed for the gathering. The leaders stormed the stadium, "breaking down doors and the main entryways, causing much violence that left dozens of victims, including 53 who died by suffocation and four killed by ricocheting bullets, which were recorded that day by authorities working with the Guinean Red Cross and verified by hospital officials," the government said. It accused the leaders of looting two police commissaries before the demonstrations, letting prisoners out of jail and stealing weapons. The government said it condemns "these deliberate acts in violation of the law, and are working to find and bring to justice those responsible for these reprehensible acts." The AU noted the violence comes amid serious uncertainties and setbacks in the effort to restore constitutional order to Guinea after the December coup. The AU urged the coup leaders to stick to their vow not to run for office in the January presidential election. The European Union's foreign policy chief Javier Solana, also condemned the actions of security forces in Conakry on Monday. Solana called "for the immediate release of the arrested political leaders" and asked authorities to "exercise maximum restraint and ensure a peaceful and democratic transition." Guinea was thrown into turmoil in December after the death of President Lansana Conte. He was one of only two presidents to rule Guinea, after it gained independence from France in 1958. Conte came to power in 1984, when the military seized control of the government after the death of the first president, Sekou Touré. Following his death, Camara seized control in a bloodless military coup and declared himself president of the National Council for Democracy, which he called a transitional body that would oversee the country's return to democracy.